Living this far north, we’re attuned to signs of a waning summer: shorter days, cooler nights, red maples in low-lying areas turning their trademark color. But when the asters bloom, I know the curtain is coming down on summer. The asters are some of the latest blooming flower species in our region. Not every species waits until virtually the last minute, but many do. You might think that they’re cutting it close. In an area of the world where a killing frost can come seemingly out of nowhere, a late bloomer might be taking a chance. But evolutionarily, it’s not a bad tactic, said Arthur Haines, a research botanist for the New England Wild Flower Society. By putting off blooming until late in the season, these plants have a virtual monopoly on the attentions of bees and other insect pollinators. “They’re not going so late that the insect pollinators aren’t going out any more. And most of them start prior to a lot of the killing frosts that would really send the insects into some form of dormancy. But certainly that might mean that they have a really brief window” to get pollinated and set seed, Haines said. It seems to be a strategy that works. Asters are widespread in the Northeast. And now, a disclaimer: most of the plants we know as asters are no longer in the genus Aster. Not so long ago they were. But over the past 20 years, botanists took a hard look at North American asters, analyzing their structures and DNA. What they found was that most of the New World species weren’t actually closely related to the asters of Eurasia. And so all but two ended up in new genera, with new scientific names and subtly changed common names. There are 38 of these “aster relatives” in our region and one true aster, the non-native garden escapee Aster tartaricus, or the Tartarian aster, said Haines. Some of the aster relatives are now known as American-asters. (The hyphen is important because it denotes that it’s not a true aster.) One of the best known of this group is Symphyotricum novae-angliae, or the New England American-aster. It is one of the more common in Vermont and New Hampshire and, because it is a tall field-growing plant with a large flower head (typically purple or rose, with yellow in the center), it gets a lot of attention. Fields are a favorite place for many of the American-asters and other aster relatives. But these species grow in a wide variety of habitats. The wood-asters, for instance, grow along the edges of fields and in the woods. There are species that grow in salt marshes, others in open wetlands, including tidal wetlands or along river shores. “Most are found at relatively low elevations, but some climb up on the slopes of mountains. There is one that grows in subalpine areas in pretty exposed places. This whole complex of species is really ecologically diverse,” said Haines. Haines has favorites. Some he likes because of their rarity, others because of where they grow. One is the Anticosti American-aster, a rare species that was thought to have disappeared from New England entirely when the Aroostook River in Maine and New Brunswick was dammed in 1923. A few years ago, Haines rediscovered it. 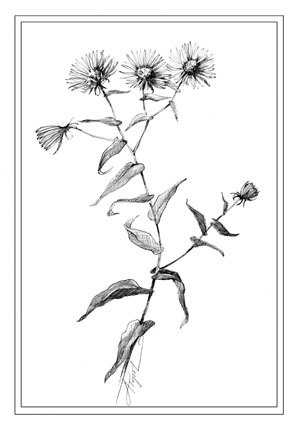 Another is Tradescant’s American-aster, a short-stemmed species with small flower heads and short white rays that’s found in northern New England and Massachusetts. It grows on rocky river ledges–not a cushy environment–where it deals splendidly with flooding and ice-scouring. “It’s not nearly as showy as the ones you see when you go down the road, so it requires you to look a little closer,” said Haines. Then there’s the Arrow-leaved American-aster, which is only present in New England in southern Vermont, though it’s more common farther west. It’s one of a small group of American-asters with heart-shaped lower leaves. What Haines finds fascinating is how many of these “native weeds” thrive in human-disturbed habitats. “They’re an integral part of our ecology,” he said, one that has evolved with native pollinators and other insects.